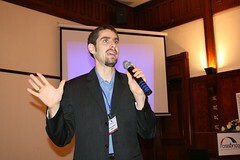 The presentation on FOSSBRIDGE EU-Vietnam went well. There was a lot of interest and questions from the audience. It is great to receive such a positive feedback. The 24th Chaos Communication Congress (24c3) starts tomorrow in the Berliner Congress Center at the Alexanderplatz. I will have a lightning talk on the FOSSBRIDGE under the somewhat controversial title “Towards a ‘free (software) world’ – Experiences of FOSS Bridge EU-Vietnam”. I will be speaking on Sunday 30th December between 17:15–19:30 in Room#3. Please join me! The first face-to-face meetings of FOSS companies from Europe and Vietnam have passed over a month ago. We have received some very promising proposals of joint collaboration projects and another article on heise.de. We are looking forward to supporting companies in their projects. .. and I personally hope everyone will keep up the energy and commitment even though of the “catching-a-cold-period” and upcoming Christmas. An interview with Balthas was published in Telemedicus a few days ago, where he also explains the idea behind the FOSS Bridge project. In the talk he especially stresses the importance of joint collaboration rather than passive development aid. Slides of the last FOSS Bridge events are now available hosted Slideshare and tagged with fossbridge2007. The most popular fossbridge2007 slide with over 1000 views currently is provided by Yerbabuena Software from Spain. A total of 42 agreements of cooperation were reached between Vietnamese and European business partners at the end of the first matchmaking event of the project “FOSS Bridge EU-Vietnam” for small and medium-sized IT enterprises in Hanoi, Vietnam. The one-week event attracted over 40 IT companies from Vietnam and Germany, France, Spain, Belgium and Sweden, who all share an interest in Free and Open Source Software (FOSS). 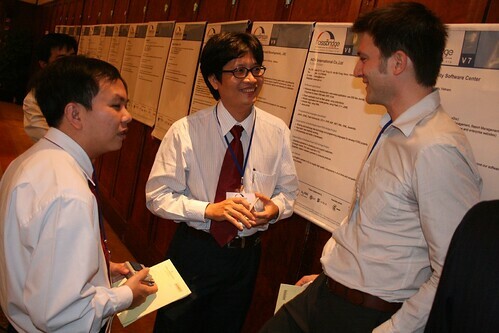 In over 60 matchmaking encounters, they successfully discussed cooperation plans for joint business in Hanoi from 12 to 16 November – after three months of online interaction and matchmaking through a web platform on www.fossbridge.com. Satisfied by the proven success of the very first twinning event in the field of open source, the consortium is committed to bringing FOSS partners from Europe and Vietnam further together. Mr. Balthas Seibold, Senior Project Manager of InWEnt Capacity Building International, Germany comments: “I am amazed by the results of this workshop. Many companies actually signed multiple agreements, and large companies like Bull, MySQL, OTRS of Europe and CMC Soft, Vietsoftware of Vietnam are on board of FOSS Bridge.” Ms Catherine Nuel representing INRIA added: “The organization of this event is an outstanding example of Inter-European as well as Vietnam-EU business cooperation. Until 2009, we will organize numerous training and capacity building programs aiming at local companies, business intermediaries and IT associations”. The main goal of “FOSS-Bridge EU-Vietnam” is to develop business partnerships between software players in Vietnam and Europe. Cooperation is based on the innovative model of “Free and Open Source Software” (FOSS), which fosters open cooperation and joint building of software code worldwide. For that, each company from Vietnam is twinned with a counterpart from Europe for joint projects – increasing knowledge base and cooperation of the partners. The main goal of FOSS Bridge “EU-Vietnam” – Joint Business through Free and Open Source Software (FOSS)” is to strengthen Southeast Asian software industries and to boost co-operation with Europe through innovative collaboration on FOSS and business development. to European and Vietnamese IT-companies — twinning between Europe and Asia FOSS Bridge “EU-Vietnam” organizes dedicated matchmaking and twinning for your FOSS-company, which brings you together with selected small to medium IT-enterprises (SMEs) from the other country/region. Your developers/FOSS experts have the opportunity to collaborate on joint software projects, thereby boosting the sharing of technological know-how, the exchange of best practices and development of joint business. You are twinned through several face-to-face meetings and training sessions in Vietnam and online collaboration. to FOSS- intermediary in Vietnam — expert knowledge on innovative business models and EU-regulations FOSS Bridge “EU-Vietnam” offers training and information on technical regulations to intermediary and small and medium-sized enterprises (SMEs) in the field of FOSS in Vietnam. The focus lies on establishing innovative business models for potential use in Vietnam, providing crucial knowledge on regulations and requirements to access the European marketplace. to Network Partners — access to a new FOSS-network and ecosystem FOSS Bridge “EU-Vietnam” fosters collaboration on FOSS between Vietnamese and European companies through the use of virtual networks. This system contributes to a sustainable FOSS ecosystem involving multiple stakeholders and networks from Europe and Asia. The project gives network partners the opportunity to involve their members in exclusive twinning and networking activities. Thereby the networks have the opportunity to expand their community and gain access to a larger number of developers. Furthermore, the initiative is actively looking for media and networking partners to promote the idea of FOSS Bridge “EU-Vietnam”. The project offers interesting advantages for networking partners, such as promotion, exclusive media relationships and more.